Many residents enjoy an age-old saying of “home is where the heart is” when talking about the town but look in-depth because it’s achieved much more than being an expat destination. To appeal to tourists and foreign house buyers, many other tourist towns around the world have marketed themselves as something special and failed spectacularly. Belek is a winner though. Targeted marketing, global promotion and careful urban planning have turned it into Turkey’s golfing capital, and a mecca of world championship golf courses, schools, clubhouses and tournaments. Taking on Spanish and Portuguese golfing hotspots, many famous figures including Barack Obama and Tiger Woods practised their swing there. In 2016, it also hosted the G20 summit. So, don’t be misled by its low profile on the mainstream Turkish tourism scene because when it comes to golf, Belek does it in style with bucket loads of professionalism. Its reputation doesn’t need more admiration, but in recent years, it also opened Land of Legends Theme Park. Call it Turkey’s version of Disneyland to understand why it has a hard-core legion of global fans. So apart from 16-world-class golf courses, impressive 5-star hotels sitting aside them and roller coasters rides, what else do residents look forward to? Given it is a beach summer resort, from May to October, people’s social agendas are jampacked from morning to night. Outdoor activities like water sports, swimming, sunbathing, photography, hiking and exploring cultural sites entertain all ages, while evening times means indulging in the time-honoured alfresco dining tradition. Once the tourism seasons closes in October, the social community agenda dials down a notch, but there is still plenty to do. Belek is just a short bus ride away from Antalya city centre, a year-round hub and city destination. Golf courses still open as do the spa and wellness centres and many foreign expat groups do a different activity every weekend. Across Turkey, weekly street markets are a favourite community feature, and Belek is no exception. Held every Saturday, it sells everything you need, but if you miss that, head to nearby Kadriye, on a Tuesday for their market. Tourism is a significant trade, so souvenir shops are everywhere while larger supermarkets cater for your everyday food items. One benefit is that ultra modern, large, shopping malls like Terracity that have stores, food outlets and entertainment centres under one roof are just a 30-minutes drive away. Being a car owner is not a top priority because cheap and frequent local bus service runs year-round to surrounding neighbourhoods. Buses also go into Antalya city centre boasting a broader range of shops, restaurants and bars. A significant advantage is Antalya Airport, 30 minutes’ drive away. As one of the top touristic Turkish airports, it’s super modern, and open year-round for international flights. Despite its high-profile status, potential property buyers will be surprised with average prices per square meter. The real estate portfolio offers ideal homes for budget and first-time buyers with prices starting at around £40,000 for a one-bedroom apartment. However, Belek is an all-rounder and has much more to offer. Large villas with private pools, landscaped gardens, fitted wardrobes, and ultra-modern home technology are also on the market and most are priced at less than £500,000. Belek also appeals to buy-to-let investors because it captures two tourism niches; golfing holidays and the mainstream tourism scene. As part of the vast Antalya region, which is also the second most popular holiday destination in Turkey, owners of buy-to-let property have two large markets to advertise to. When renters are not practising their swing on the golf courses, they can also sightsee, party, shop, eat, drink and relax. 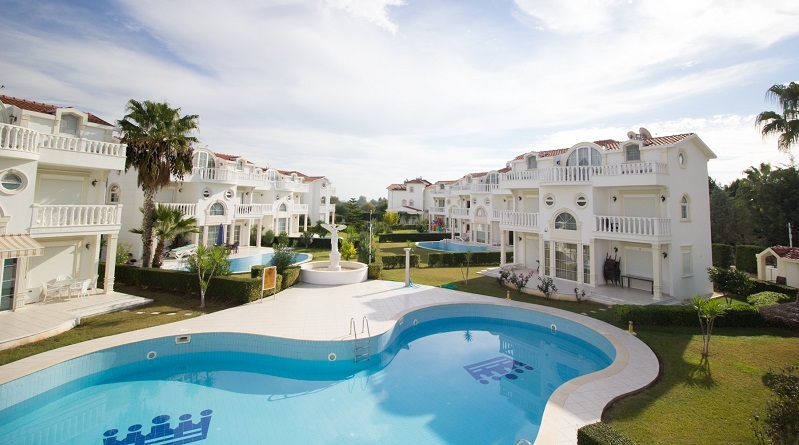 Aside from that, if your dream is living in Belek, finding a comfortable home, with amenities close by is easily done, when done on our viewing trips of neighbourhoods and potential properties. Otherwise, for a snapshot view of how the real estate market performs, see our Belek property portfolio, and if any home captures your interest, call us to find out more. Districts of Antalya: As a large part of the Turkish Riviera and Mediterranean coast, Antalya is a popular spot for foreign house buyers and expats in Turkey.